Palestinian Rights Center (PRC) also known as a front for Muslim Brotherhood; if approved, could sit in on UN debates. 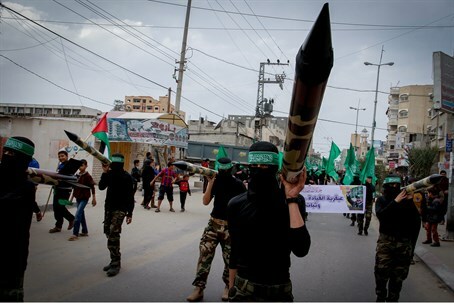 Palestinian Arab terror groups are set to receive even more United Nations (UN) legitimization this week, according to watchdog group UNWatch - this time, in a committee for non-governmental organization (NGO) approval headed primarily by Iran. An annual conference being held by the 19-member Committee for NGOs is being held from May 26-June 3. One of the groups being considered for full NGO status includes the Hamas-linked Palestinian Rights Center (PRC). The PRC has hosted Hamas leaders on a regular basis, according to the Telegraph, including arch-terrorist Ismail Haniyeh. Watchdog groups monitoring the Muslim Brotherhood have noted that the PRC's leaders include Ghassan Faour, a member of Hamas front group Interpal, and Zaher Birawi, the head of the pro-Hamas Al-Hiwar TV with ties to Muslim Brotherhood leaders in the UK. The Meir Amit Intelligence and Terrorism Information Center has released an extensive report on the PRC as well, and concludes that the group is closely affiliated with Hamas and the Muslim Brotherhood, and that several of its members are terrorists who have fled to Britain. If certified as an NGO, the UN would allow the group "to acquire official UN badges," according to UNWatch, as well as "full access to UN facilities and participation in debates in New York, Geneva, and Vienna, and, perhaps most significantly, global legitimacy." According to the meeting's official timetable, the PRC has applied for NGO status before, and has been rejected. One other Palestinian Arab group also scheduled for consideration includes Palestine Sports For Life, a sports group based in Ramallah which has been heavily covered in the media, including the Guardian and Al-Jazeera, in 2010-2012. All of the articles portrayed Israel as heavily clamping down on Palestinian Authority (PA) sports activity and freedoms, and feature the group's leaders denouncing the "occupation."